Battle Honour CAMBRAI 1917,18 - the Third Day. 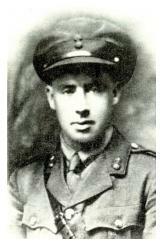 James Samuel Emerson was born on 3 August 1895 in the village of Collon, near Drogheda, in County Louth, Ireland. He enlisted into the 3rd Battalion The Royal Irish Rifles, a Reserve Battalion in Dublin, on 16 September 1914, and completed his training before sailing for France with the British Expeditionary Force on 16 April 1915. He served as a machine gunner and was promoted twice. As a Corporal he was wounded at Hooge on 29 September and evacuated to a hospital in the United Kingdom. When his convalescence was complete on 24 January 1916 he was posted to the Garrison Battalion, 3 RIR, in Portobello Barracks (now Cathal Brugha Barracks), Dublin and was there during the Easter Rising. He returned to 9 RIR in France on 28 June 1916 and fought at the Battle of the Somme. On 7 February 1917, he returned to Lichfield, England and began officer cadet training. On completion, he was posted on 1 August 1917 to the 9th Battalion The Royal Inniskilling Fusiliers as a (Temporary) Second Lieutenant. For repeated acts of most conspicuous bravery. He led his company in an attack and cleared 400 yards of trench. Though wounded, when the enemy attacked in superior numbers, he sprang out of the trench with eight men and met the attack in the open, killing many and taking six prisoners. For three hours after this, all other Officers having become casualties, he remained with his company, refusing to go to the dressing station, and repeatedly repelled bombing attacks. Later, when the enemy again attacked in superior numbers, he led his men to repel the attack and was mortally wounded. His heroism, when worn out and exhausted from loss of blood, inspired his men to hold out, though almost surrounded, till reinforcements arrived and dislodged the enemy. His will instructed that any items of property found on his person were to be left to 14434 Abraham W G whose Army Number was only four different from his Rifleman's Army Number 14430 as they had probably enlisted and trained together in Ireland. He has no known grave and is remembered, along with six other Victoria Cross recipients, on the Cambrai Memorial to the Missing which stands at one end of Louverval War Cemetery. Brigadier-General Hackett-Payne presented the Victoria Cross to his mother on 3 April 1918 in a ceremony at the Whitworth Hall in Drogheda.